Well this is where things really get interesting, so stick with this thread as there are dozens of photos of fossils coming up. Looks at the tags if you want clues. I was up bright and early and wandered out at about 7 am to watch the sun rise over the still mighty Erg Chebbi dunes. And as night's candles were burnt out and jocund day stood tiptoe over the misty duney tops, the chaps came to join me and managed lots of photos. Here's one, if you would like to see more, I'm busy posting a kazillion of 'em under the Nature Photography thread. UPLOADING LOTS AND LOTS MORE PHOTOS. IT'S SO EXCITING ! ! ! ! I'm very methodical. I have to sort the pictures in order. wifey arrived soon and I went to help her climb the little dune ridge. She is looking for her camera-phone thingy. The popcorn is flying .... is your connection slow there ?! My pace of life is pretty slow, the connection is very good. I share of lot of characteristic with my tortoise. Here are wifey, Anouar and me, hoping the day will warm up a bit. Just a couple of degrees above freezing here. And one more photo of the dunes as i love them so much. No mountains in the distance here, only the huge dunes of the Erg Chebbi. Loving it so far. I love desert shots, I guess because it's so different from my temperate rainforest home. But the fossils can start any time, too. Eagerly waiting for more pictures..
Yeah, it surely can't be me, that fellow looks far too old. Patience chaps, enjoy the antici.............................................................................................................................................................................................pation. And so we left the ergs behind and headed off into the Black Sahara; a part of the rocky hamada that makes up the bigger part of the Sahara, the sand and dunes is only a smaller part. 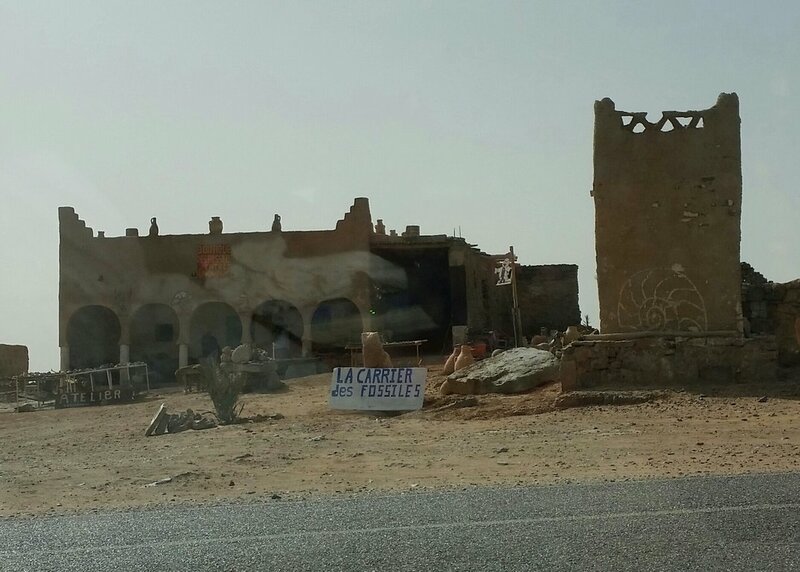 Top Tip : As you drive into Erfoud from the south on the road from Merzouga, stop when you get to the very first fossil shop you find. Park on the hard shoulder opposite the shop and then follow the rough track that is signposted "Des Fossiles" heading away from the road down a slope. LOTS OF PHOTOS OF FOSSILS TO BE ADDED. Are most signs in French since most foreigners do not know Arabic? Do you negotiate fossil purchases in French too? In other words, what languages are used with the tourists wanting to buy fossils? French is Morocco's colonial, and therefore official language. Everyone speaks it. And yes, it helps get the tourists into your shop. (These are my educated guesses from experiences in Algeria and Niger). Thanks Adam for posting these. I recall fondly my own trip to Erg Chebbi 25 years ago. Back then the only way to visit was by jeep. I hear there is a paved road now. It was quite an adventure. I stayed there two nights in a Bedouin tent and saw the dunes at both sunrise and sunset. I wish I had more time to go there when I visited Morocco last year. The people of the area are down south are a mix of Berber and Arab. They prefer to speak only in their own language, but most can speak French (though far from all). Many of the shopkeepers have learned at least basic English, but as the many people are illiterate here and few foreigners speak Amazigh (Berber) or Darija ('Moroccan Arabic that doesn't even have a written form), the signposting is usually done in French as their written English is generally not up to scratch. I negotiate in a mixture of Darija, French, English and a little bit of Amazigh. (Spanish sometimes up north). Depends on the situation and the vendor. The official languages are Arabic and Amazigh Berber (recently added as half the population are Berber). French is not official, but in reality is used in most legal and educational systems though many are trying to change this as it is believed English is more useful in a global sense and that French rule is long gone and best forgotten. Science at universities is often taught in English, but there are not enough highly qualified teachers who speak good English to make a complete switch. It's estimated that English will be taught in primary schools instead of French beginning in about 10 years time. Algeria is switching much quicker to English in education. I've been to Niger but only briefly, so can't really say what they're up to. The Erg Chebbi is most impressive and, yes, the road goes pretty close there now. There is a massive problem with littering, four wheeled drives and quad bikes destroying the ecology etc. Most of the 'Bedouin' tents and encampments are about as authentic as those composite Mosasaur jaws that one sees. It's all done for the tourists. When I went this time there were 210 'Berber' camps in operation in just the Erg Chebbi area. The week after I came home, the local government closed down more than half of them as they were operated by 'foreigners', people from Zagora, Marrakech etc. and were taking from the local economy, adding to the pollution and so on. There is talk of stopping this completely due to the environmental impact; litter, pollution, destruction of dunes, vegetation and wildlife, no proper sewage systems and so on. Trouble is tourism is a major source of income down here. Anyway, walking down the ridge one soon finds oneself walking on the ancient sea floor. 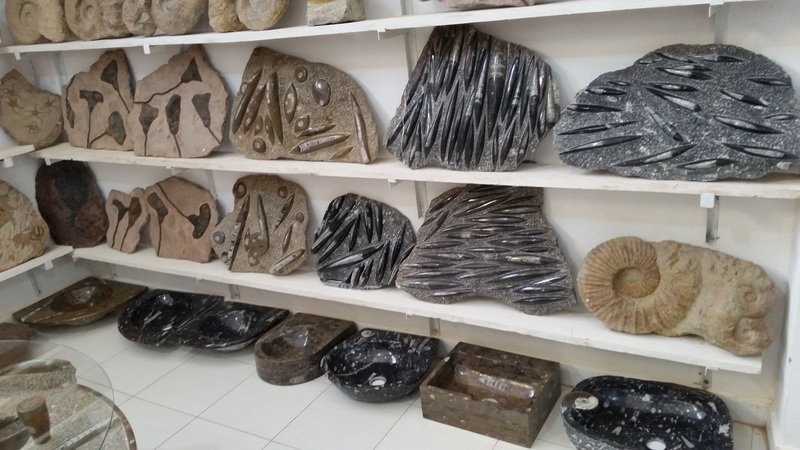 This is not the black "Orthocerid Marble" you see for sale in most places. Top Tip : The black and white orthoceras marbles with only orthocerids in them, often current aligned, are from the Middle Ludfordian, near the top of the Ludlow, so Upper Silurian in age, about 420 mya. This has been confirmed by a detailed study of the succession and the conodont assemblages. The cephalopods are often referred to as Orthoceras, but this is incorrect as this genus is now only used for certain forms in the Baltic area. They are often called Geisonoceras, but this also is incorrect, though many of these are from the family geisonoceratidae, but are actually a variety of different species of Arionoceras, plus Harriosonoceras, Michelinoceras, Kopaninoceras and others depending where you are. For these beds extend for 80 km by 35 to 40 km, sometimes at the surface and often (as in Erfoud itself) not. 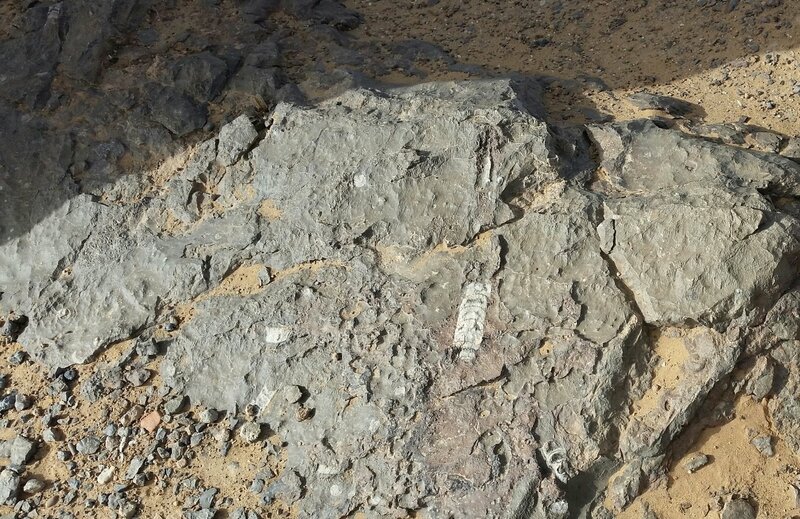 These fossils are mostly dug up in the area of Rissani, though there are other locations, and then sent to Erfoud for prepping. If these pieces with large black and white aligned orthocones in a black matrix appear with large gonitites, especially if the goniatites are brown, these are fake! Goniatites didn't exist in the Silurian. Top Tip : The black and white pieces with a mixture of orthocerids and gonitites are Middle Devonian in age, not fake, but the orthocerids are usually small and not so well preserved.These are Late Eifelian, about 395 mya and include the orthocerids Apioceras, Brevicoceras, Moneroceras and several others plus the goniatites Agoniatites, Cabrieroceras and Subanarcestes. These come from the same sort of region, but not Erfoud itself. Top Tip : The brown matrix stuff with orthocones, goniatites and clymenids is local stuff from Erfoud. This is what I was walking on. The specimens include Platyclymenia subnautilina, Prionoceras sp, Erfoudites zizensis, plus others and undescribed orhocones. It is Fammenian, Upper Devonian in age, about 365 to 370 mya. Top Tip : There are several cephalopod limestones ranging from the late Silurian to the Upper Devonian in this region, many of the others I haven't mentioned include numbers of large goniatites, but, if you find the brown ones mixed with the black ones, or big goniatites and big orthocerids in the same piece, they are composites. thanks for all the really informative posts. It’s a place I’d love to go to but it will have to wait until the kids leave home. I never had children or baby goats. And thank you for your kind remark.